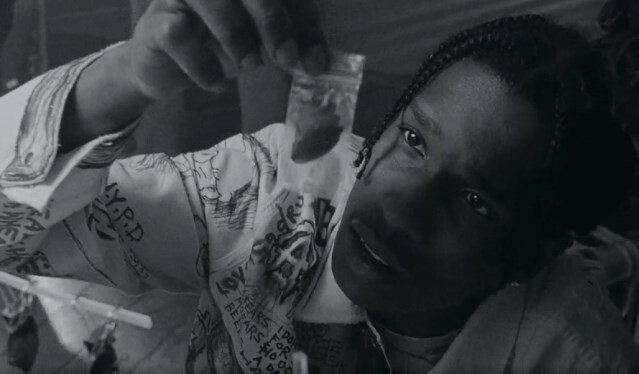 A$AP Rocky’s short film project ‘Money Man’ premiered in London on Friday, featuring new music from the mob’s upcoming Cozy Tapes Vol. 1. Skepta, La Haine actor Said Taghmaoui and A$AP Nast feature in the intense 12-minute visual. The piece was shot in three days around northwest London, directed by A$AP and Dexter Navy of Partizan, tracing the story of a young woman named Rina as she navigates the underworld of crime and violence that surrounds her. A drug made from scorpion venom and butterfly wings plays a central role. Produced by A$AP’s creative collective AWGE, the film sees the rapper take on the role of Money Man Flako, a sidekick to boss Money Man, played by La Haine actor and screenwriter Taghmaoui. Red Bull, who premiered the film, notes that Money Man was greatly inspired by the 1995 film La Haine. “Put That On My Set” featuring Skepta and “Money Man” featuring A$AP Nast soundtrack the film. You can watch the video here and check out the tracks below.